This week, we continue to look back through The Wake Forest Series of Irish Poetry as we prepare to publish Volume IV. Today we’re featuring Moya Cannon from Volume II, whose subtle yet distinct voice demands a reader’s attention. Her poems are largely preoccupied with the sphere of landscapes, and how human desire—sometimes expressed through the invocation of Greek myths—is interwoven into the natural world. In her poem “Viola D’Amore,” Cannon derives reason for how the earth can live through us, and with us, without us ever realizing it. 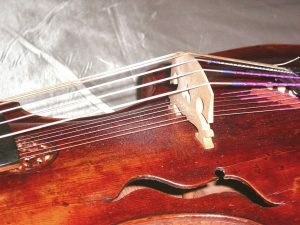 *A viola d’amore is an instrument from the baroque period, similar to today’s design, but with key differences. The “hidden strings” Cannon refers to in this poem are additional strings set below the main strings that the player draws the bow across. These are called “sympathetic” strings because they vibrate in sympathy with the notes being played, creating a richer, warmer sound.